Hi… I am so glad you stopped by to see me today, because I have a question for you. Do you ever share my feeling of being overwhelmed and emotionally drained by all the trash and social debris coming at us every day? If you too have had this experience, I have someone I would like you to meet… his name is Randy Pausch and he can help deliver some treasure to you today. He was born on October 23, 1960 and he likes to talk about achieving your childhood dreams. He actually did reach some of his childhood goals before he was diagnosed with pancreatic cancer… a diagnosis that is almost a death sentence! So, for Randy, with that diagnosis made for him, he had only about six months to live. He was then, a professor at Carnegie Mellon University, and he was a perennial favorite with the students. They loved his innovative class and his lectures! So, with his unusual upbeat personality and sense of humor, a genuine sense of character that came through loud and clear, he courageously delivered “The Last Lecture” in September, 2007. Randy passed away on July 25, 2008. 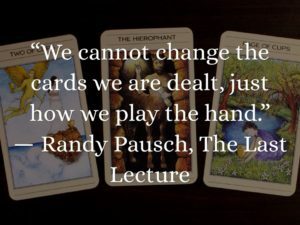 His message, for all of us, has been preserved in a small book, aptly entitled, “The Last Lecture!” The message in the book will inspire you, and the following is a preview of Randy’s profound ant thought provoking quotations. “Brick walls are there for a purpose… they let you prove how badly you want something!” James 4:17, So whoever knows the right thing to do and fails to do it, for him it is sin. “Experience is what you get when you didn’t get what you wanted!” Job 12:12, With the ancient is wisdom and in length of days understanding. Want more? Get the book!